Olaf Niemeier, a celebrity fusion chef is in town and in what better place than Fusion 9. He is apparently called the Food Picasso for this artistic food presentation and has traveled extensively in Asia, but did not want to let go of his German roots and so he decided to fuse the two. 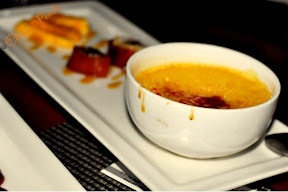 By an invite from the restaurant, I was there to try out his creations and well........read ahead! We had two starters, a duck roast and a Mille fillu. 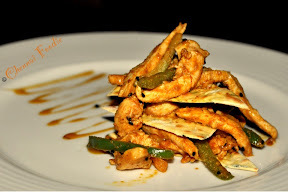 The Mille feuille, which is traditionally a three layered puff pastry, was tweaked to be savory, and had complete Indian flavors. I was curios to see what a savory Mille feuille and it was an interesting twist. The duck roast was not to my liking at all because I do not like duck, done medium and I am not sure if too many Indians will like it that way either. For the main course, we had a lamb rack and a salmon steak. 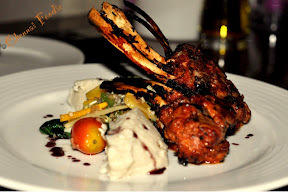 The lamb rack was tasty, it sort of had indian flavors on the lamb served with mashed potatoes and a western salad, so that was the fusion and tasted ok, while the salmon steak was served on a bed of lemongrass and Asian spiced base. Interesting twist to a salmon. We both found the fusion to be a little too much for our liking and maybe we need to learn to appreciate true fusion foods or be be happy with the so called fusion. Just like how I currently prefer Indo Chinese, but one day hope to appreciate true Chinese food! While we were there, we shamelessly asked for their tandoor brocolli, something I drool over everytime I go there and that was the best food thus far. And then came the best part of the evening, the desserts! And they were true fusion foods but with an important rider- they tasted fantastic. The first one, a chocolate rasamalai, even the name got me wanting it even before the main course. If marriages were this perfect, there would be no divorces! 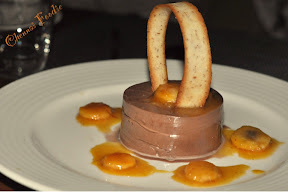 Perfect mix of chocolate and rasamalai with the rasamalai inside the chocolate mousse. I really hope they get it perfect every time they serve it! Served with a banana crisp, it was just brilliant. The next was the coconut burfee creme brûlée, wah! Again, perfect fusion. The coconut pudding inside was very nice and it had a near perfect creme brûlée, nice and crackling when you dig the spoon inside. 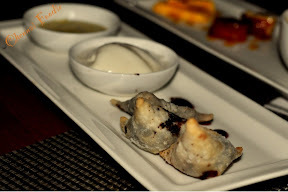 And the last one was the chocolate samosa served with yogurt icecream (in typical German style, it was spelt Jogurt). Bliss! I rest my case. Prices are on par with the fusion 9 prices! Even if you don't have time for dinner, get some desserts here. I hope they are able to maintain this quality for the next ten days that this festival is on. Fusion 9 is on Sterling road, in the Quality Inn Aruna premesis. What I would order - just the desserts on this special fusion menu and tandoor brocoli.